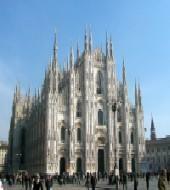 A 3-hour guided tour to discover the treasures offered by the city of Milan. Admire, with an expert guide, the highlights of the city, enjoy the architectural and artistic masterpieces: starting from the unmissable Sforza Castle you will walk through the Milan city center up to the San Maurizio Church, the “Sistine Chapel of Milan”; afterward you will continue your tour along the Piazza Affari where you will admire the famous statue “The Finger” of Maurizio Cattelan in front of the Stock Exchange of Milan. Admire with your guide the San Satiro Church, with the illusion of space created by the great architect Bramante. The walking tour will allow you to visit also La Scala theatre Opera House (outside), the Galleria Vittorio Emanuele II and at last but not the least the wonderful and breathtaking Cathedral of Milan. 15 minutes before the tour starting time at the main entrance of the Sforza Castle, in front of the fountain (on the side of the fountain facing the main tower). Find more details on your voucher!